My "Fluorescence" mushrooms are pretty much iconic by now (at least within the niche of "wallpaper aficionados") but their purpose for me has always been something akin to the teapot model that comes with Lightwave. Basically it's a prop on which to display different textures. Here I am experimenting with distance gradients and sub-surface lighting. I also wanted to upgrade the terrain with something a little more hi-res and bump up the radiosity lighting so the mushrooms themselves appear to be casting all of the light. Was expecting a bigger version of the "shrooms" when I opened up the dual screen. What a neat surprise when there were two more sets in the render with different colors. Very cool! Favorite backdrop for my tablets. I love your many mushrooms! Request for the 2001 Holiday Fluorescence -- Christmas to be rendered in new screen resolutions, please? Are we ever going to be able to get fluorescence2k93 in iPhone 5 and iPad HD resolutions? Thanks for alerting me to this! Try it now and let me know if you are still seeing the white border. Be sure to reload the image or you might see the broken one from your browser cache. "Something wrong with the 1600 x 900 (16:9) version"
Love your mushrooms and so many more of your pictures. I have your mushrooms through the color spectrum, also your sea anemone. I'll be interested to see how your experiment goes with the mushrooms. Love how your seasonal pictures change and your day and night ones change. Beautiful. The 1152 x 864 version of fluorescence2k91 is missing. this one is absolutely awsome. the best of those fluorescence pics, the composition of colours is great! I've been a fan for awhile. This is by far the most awesome Flourescence yet!! "360 x 640 for Sony Ericsson Satio"
Can you try to render the images for a screen of 360x640 please. I would like to have all the digital blasphemy photos on slideshow on my Satio. Show off your excellent work to all my friends and family. Hi, there is no 240x320 version. I'm putting it on my Sony Ericsson M600i which has that screen. I tried 360x480 which has the same aspect ratio, but it looks bad because of being resized. "searching for all Fluorescence pictures"
why doesn't this image turn up in titlesearch when searching for "Fluorescence"? I love every single version of the Fluorescence wallpaper, back to the original. This one is the most awesome, by far. Just wanted to share a funny moment. I display DB images on my work computer and I get quite the comments from co-workers who have no idea what DB is. Everyone really likes them and some think some of them are real pictures I took!? 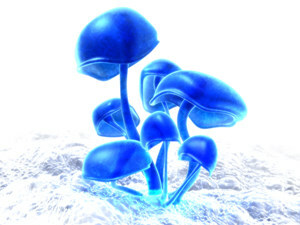 My one co-worker saw this image on my PC the other day and asked why I had psychedelic mushrooms on my computer. I got a good laugh. This has been my wallpaper since it was posted, and I just love it. The colors are wonderful and awesome. Thanks for this masterpiece! Reminds me of metroid prime: my favorite video game of all time. Amazing job. Whoa!! Dang, but it is NICE! What an eye you have sir; this one really glows. I'll rate it as high as I can. Beautiful!! This image -- the dual widescreen version -- is shown in an article I did for this week's DistroWatch Weekly (http://distrowatch.com/weekly.php?issue=20090914). Full credit given to Ryan, of course, so hopefully it will drive a few new subscribers this way. I have loved Fluorescence since it debuted, but you have really outdone yourself. Bravo. "I really love this one"
I know Fluorescence is like a household name around here however I have never really enjoyed it until now, this one is just amazing, and now it is a DB household name for me, thank you!! The link for the 240x320 mobile res for the Zune downloads as a 240x260 res. Could you fix please. Thanks. "Looks great as background on PS3"
I found that with a bit of adjusting on the dual screen version I could get the smaller mushrooms to the left of the menu choices and the bigger mushrooms to the right of the menu choices, some of the sides are cut off but the 'bar' at the top where the picture stops doesn't show cause it's black like the top of the picture. It frames the text perfectly and looks fabulous! The dual screen version of Fluorescence is perfect. The left screen has plenty of room for desktop icons and the right fills a screen that has no icons. Looks great. Only a 0.3 rating difference between colored & Blue. They're as different as night & day. I just received my new laptop that has a LED display and this image really does it justice with incredible color clarity, I am definitely looking forward to more!! Did you ever plan on doing something like this with your Fluorescence for us, or was this just done because of popular demand? Just curious. BTW, This is totally awesome! Went on my netbook, Ipod, and desktop as soon as you posted it. This made it to my desktop immediately, not just into the file archive :-)!! LOL @ the different "strains" of mushrooms :-D! Don't like them at all.Definately prefer the blue ones. The combination and spectrum of colors here is both outrageous and bloody brilliant! This creates a hypnotic/hallucinogenic image that is far more profound than any previous versions. 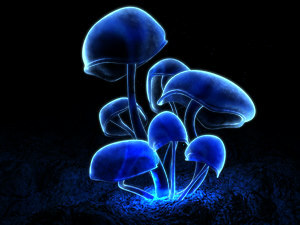 It also achieves as others have mentioned, that psychedelic effect which is synonymous with mushrooms. You are a perfectionist at heart, and that is why you just couldn't leave this one alone. You knew that it deserved so much more, and now you have done it! This image has now shot up to the top 3 of my list. Did I mention those color choices are mesmerizing? I am so glad you decided to pimp this one out like you did. Yah boy! I dislike this revision! The blue version of this pic was what should have replaced the 2000 version! Then you go and replace the 2009 blue version with THIS? I thought you said that you were not going to do anymore with Fluorescence or Fluorescence 2009 after you released the blue version of Fluorescence 2009. I did not rate Fluorescence 2009 because it was off the RICHTER MATE :) I will rate this version....... as low as I possibly can! 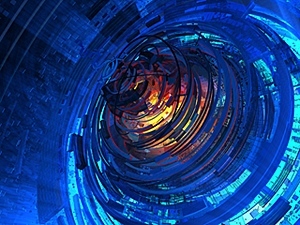 And I agree that both the blue and the colorful version should be posted on the main page. No need to picklejar the blue version -- let's have both! I love the colors in this version! Actually, I love everything about it. Right to desktop. Wonderful work, Ryan! I'd also love to see a purplish version, like the smaller mushrooms in the dual widescreen. Any possibility of that? That's the best comment I've read on here in a while, thanks for that. I have to agree that this is an outstanding rendition. Well done, Ryan! Thanks for adding the multi-monitor versions! I still like the blue version, but this one is absolutely outstanding. Nice spin on a classic, love it. got to dl this one. I think that both the colors and the blue deserve spots in the gallery. The blue is your trademark and the color is fantastic. You post both the day and night versions of your landscapes, why not both of these? Can't wait to show this one off at work on my Dual-Screens! This one seems to render pretty quick, can we hope for a Multi-Screen in the very near future? Oh Ryan.... I have a serious man crush on you after this !! The best ever. Well done mate.. The coloured one is really great, but I think that the blue one IS the DB trademark. First off, I would have them both in the gallery... You have Fluorescence6 & the Christmas one in the gallery... Just saying ;) I don't think you have to throw the blue on in the pickle jar. This version of Fluorescence is the best one! Ryan this is just awesome I like it MUCH better than the other new fluorescence you just did. (though it was good). This is now my wallpaper!! I love this version with the new colors; it's superb! Definitely gallery worthy, although the blue one was too; I would've left both in the gallery. I do like the blue ground better than the red ground, though. 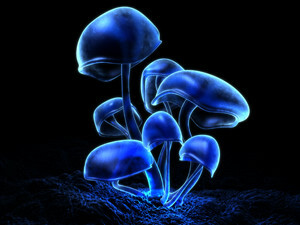 Could you render a version of this one with blue ground under the mushrooms? The original has been my favorite for years now. Now I have a new favorite. IT'S GREAT!!!! Blown away also! Thanks Ryan. I'm blown away by the texture this version offers, it seems really palpable. Hoping for a multi-screen version! Fantastic. Wonderful. Great piece of art. I totally agree that you should put it in the Members Gallery. awesome colors! much more appealing! and the very "edges" have better quality and are not faded as the blue version! Infinite Variety in Infinite Combinations. While you are at it, what sort of beastie eats those things? I like it better than the blue! Love the new version! Put it in the gallery! I love the colors, but the caps seem more opaque and darker. Is that from translating between the different tools? I for one think the should be in the gallery. I am glad to finally have grabbed the red one. I've messed with the colors, and they just don't look the same. A green one would be great also. "Photo Shop The Quick Version"
Probably the easiest way. Just drag the hue bar until you get the color you want. Lightness will make the whole image lighter or darker. Most difficult but you can do some cool things. You can make a multi-colored one Kind of like Ryan's newest version. You can click on the different shades of blue and make them different colors, or you can click all over the places and change the whole image to whichever color you want. Play around with it & you'll have fun ;) I can't create the art like Ryan can, but I love photography & then messing with them in photoshop. +1 vote to get it on the gallery. love it. I know you've been saying that different versions of fluorescence can easily be made with photoshop, hence your reluctance to post them. But I don't have photoshop, and even if I did I wouldn't have the slightest clue how to change the colors. I'm sure a lot of people are in the same boat as me. So while it might seem trivial to post color variations to you, I bet a lot of people would appreciate it. Really Love the Colours versions & the original with the "dust"
Could you please upload a 1680x1050 resolution for the original dust version & the iPhone resolution as well ? Also , Please do some more abstracts !!! Any change you make to thw work you enjoy will only tell more of the storie. It makes you think of something new you get a new idea or sparks a new thought so it wouldn't matter the color so GOOD JOB! Fluorescence has never been my favourite. The coloured one is interesting and much better than the original IMO. Kinda like the Christmas one, only I think I like it better. I'd put it in the gallery. You did the Christmas one after all. It's absolutely gallery-worthy, please make it so! It's beautiful. I know its iconic for the site, but I never loved Fluorescence as much as some of your other work, and haven't ever kept it in regular rotation -- but that changes with the color one in the PJ now. I love it. Wow - that's pretty cool! I say do it and make multi-screens! It's awesome. I've already shifted the hue several different ways and in Win7 set it to change every 10 secs to the next color. Makes a nice effect with little technology or effort. Def put it in the gallery... love it! I think the colored version is really cool! I've always liked this image, and the different colors make it that much more awesome in my opinion. Pickle jar or gallery it's up to you Ryan, just don't take it down! The new color scheme is great, but ultimately, it's still just a variation on an existing piece. I say pickle jar. "like it, love it, put it in the gallery"
Yeah. I like it a lot. Ever think of making into a tattoo? I think both deserve to be in the gallery. They both give such different 'feels'. I vote for putting this in the gallery with a full work up of resolutions! I love all your other stuff, but I just find this really dull. Although the colors are cool I was dissapointed in finding another version of this. tho the texture here is great the very edges of the "plant" seem.. to have lost their "sharpness"
the edges seem a bit faded..and "choppy"..
it shows more on high res like mine! either way is a cool revision of he original..
this image is indeed of of your best works! is simple.. glowish.. and a amazing blue color! I didn't like your original 2009 render of this piece, as compared to the 2000 version. But I've got to say, I've been looking at this second '09 render on my desktop for several days now, and I'm definitely enjoying it. I think you really "fixed" it over the first picklejar version - thanks for your quality work! Ryan, thank you so much for posting amazing triple widescreen renders like this one. It's hard to find good ones, and yours are the best. I sent you an email right before you posted one the first time, saying that I would buy a subscription immediately if you started rendering in triple widescreen, and I did just that. My only regret is that I didn't buy the lifetime membership, and I expect to when this one runs out. after all these years still an amazing piece of work ryan, one of your best :-D cheers...! I would like to have prints of Fluorescence 2009 (maybe do a new triptych), Canopy Creek, and Beginning of the End available. However, my other render machine is busy churning on the "Enshrouded" multi-screen while I am rendering new projects on my main box. I have no idea when the other render will complete. I can't believe it took 10 days to render on my main box! Back to Fluorescence. I'm glad people are liking the new multi-screen. It really does look better without the DOF. Are you going to update Zazzle with this new render? I would love to see this new version in the different colors. I really like that you took so long and changed fluorescence many times. it shows how devoted you are to your work, and how much of a perfectionist you are. I love it. good man. keep it up. I love your work. your art is by far my absolute most favorite art. in 100 years, your hard drive with all your original renderings will be worth millions, if not more. you'll see (those of you who live that long.) It'll happen. I know it. I don't really see much difference between this version and the older version. Great Great job, I really like this version better than the fuzzy one! As always, you continue to amazed!!! I ABSOLUTLY LOVE the final version of the multi monitor of this! It makes me wish I had a 3rd monitor so I could have all 3 colors on my screen! Wow Ryan, you really did a great job tweaking this one! Definitely worth the wait! Thanks for meshing the two images together by increasing the thermoluminescence of the two structures.. Looks great. The white background is too bright. A more interesting prospect would be if you could resurrect your "holidayflo" red/green stems variant from some years back, especially in a widescreen version. I have the old original but on 1920x1200 it is bent out of shape. I have successfully produced other colour variations from the basic blue by shifting the hue control etc but multiple colours have me stuffed. Thanks for taking peoples opinions into consideration when rendering your images Ryan! The updated Fluorescence is absolutely perfect imo! I was using the old DOF version on my setup here at work and I usually have my right monitor covered in outlook/excel windows while my left houses my icons and more short-lived windows. Any way we can get individual versions of it red and green Fluorescence? "I have a confession to make..."
I've been mooching your wallpapers from your free gallery for around 10 years now-- ever since I was back in high school. I never had the money to be able to spend on a membership (and I probably still don't, but I did anyway). For the last year or so I've been kind of toying with the idea of getting a lifetime membership, but still didn't really have the financial freedom to do so. But recently when you lowered the price a bit, then in addition today I saw that you'd posted coupon codes, and I just couldn't resist anymore. I figure I probably owe it to you if nothing more than for all the years of mooching your awesome wallpapers. I've been almost exclusively using your images for my wallpapers since I found the site, and I have to say, your work is some of the best I've seen anywhere on the web. Thanks for putting up a good site and sharing your talent with us. The white version is a good picklejar... but I don't think it brings out the beauty of the fluorescence... Who wants to look at things that glow in the light? No one. The beauty of fluorescence is fullest in the dark. The final version really came out well. This was one of the first images I found from DB and it's cool to see an update on it. i didnt actually like the original rework of this picture; this one is a much better update to your previous work; i would say it is equally as good as the original with the benefits of new technology. The white version doesn't allow the fluorescence to show. As for the new fluorescence version; I found it difficult to find an appreciable difference. I am one of the ones that think you should move on as well. To me the update doesn't improve the picture enough to be worth the effort. I do like the white variation but again it brings no excitement along with it and I'll never use it. Just my opinion, no offense. Looking forward to your next project. What happened to the links for the dual screen monitors? "Love It - Fluorescence (2009)"
I must say this image has always been a favorite of mine as it was the image you see when signing in. Amazing talent Mr. Bliss... I use nothing but your images on all my computer desktops. I would honestly say that I like the new ones most. 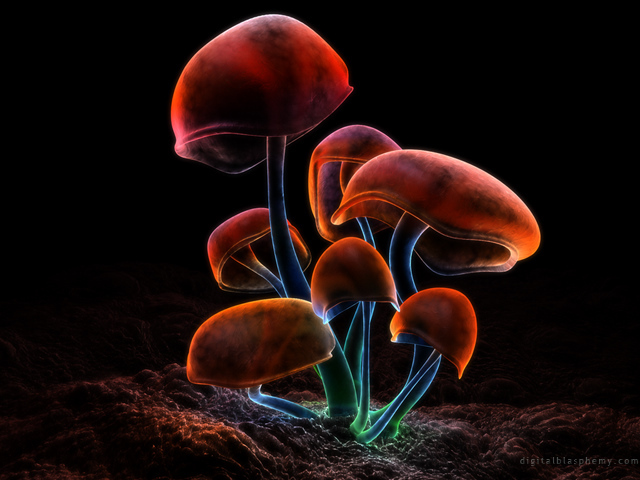 The additional detail makes the image seem almost fluid, like the surface of the mushrooms are more alive. I'm a fan of the original still of course, however this is an exceptional update in my book! I still like the original best, as do all of my coworkers who see my monitor. It never fails to stop people in their tracks to comment on how beautiful it is. This version looks less "digital", and seems to have less of a "glow" to it. Also, the texture is deceiving, and makes it appear transparent in some places. All in all, the new textures seem distracting to me. I'm sticking with the original. I'm not sure I like the third version better than the second. The white version, however, I hate; it's horrible. It's not even picklejar worthy. I think a real day version or a more illuminated version may fare better than a white version, it looks like a colored negative picture. The ground looks better in the final version, but I don't like the new highlights on the mushrooms so much. I think I am going to stay with the previous update. Don't like the white at all. I like it! It's really bright, but it's a lovely contrast to the dark background. Sorry, but I am totally unimpressed with the white background. It looks washed out and is not at all representative of the original image. I would still like to see other colors. I have tried to change the hue of the original but it doesn't look right no matter what I do. White background? yeah lets keep that one in the picklejar. The white version is super cool, too bright for my wallpaper but super cool none the less. I absolutely love the white version. I hope you do different versions of it, like the one from Christmas with the red/green. This was the first image I saw of yours, back in school years ago. Been hooked ever since. This drags up some memories! I use your art EXCLUSIVELY as my desktop background, have it set to change every 1 min ( using MuralPix, and it is AMAZING!!! I really didn't want the background mushrooms to be too much in focus. I disagree, I like the blurriness and I think it should stay. I don't use the multiscreen wallpapers, but I enjoy looking at them. I love the idea behind one side being green and one being red, but the blurriness is horribly distracting. Maybe something a bit more like the Flora multiscreen with more smaller versions. Personally I would prefer them to be all blue but then blue is my favourite colour. Love the idea behind the triple-screen version, but have to agree with some of the others; would be better if the green/red ones were in focus. I have to agree with the others about the focus with the triple screen, it would be better if the green and red ones were in focus too. They are just to blurry for the other screens. I like the idea of adding other colored "shrooms" on the other monitors. I like it a lot. But I'd prefer 'em in focus. "Looks great but missing the G1 resolution"
The wallpaper looks great but we're missing the G1 resolution (640x480). It returns as a 404 error on the link. Ryan, As always you never cease to amaze. I love the new tri-screen of Fluorescence and how you pulled the center screen into focus and pushed the outside screens out of focus. I have one questions about resolutions, I run 1920x1080 across each of my three monitors. I am able to use 7680x1600 but I either need to clip or stretch the image. Is there future plans to have a triple screen hdtv resolution? this is awesome, as always great job! us tri-screeners are still missing enshrouded! please do it quickly, this is my favorite. The picklejar Fluorescence (2009) 1152 x 864 resolution link is still broken. Thanks. I'll throw my vote in there for releases in the red and green as well. Great work! Of all the artworks, this still remains one of my all time favourites and I dig this one out every now and then to use as wallpaper, I even ordered a mousemat of this for use on my laptop when i travel! I think an extreme closeup of one of the mushrooms would be cooler than the fuzzy far away of the red and green. It feels disconnected right now...more of an afterthought. 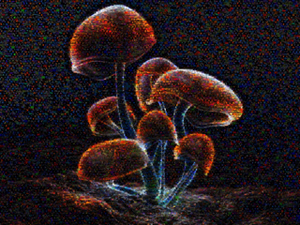 How about using the original screen as an extreme closeup, with a much higher volume of mushrooms in the background of the same (or different) colors. I think putting one red counterpart in the far off background disconnects the content in the image making them seemingly unrelated. My 2 cents. I absolutley love the original though. Very glad you did the touch up. Looking forward to future works of art. I love this updated version of one of my favorite images. My only request would be to make the red and green side images on the multi-screen renders clearer. They seem to be fuzzy, which is probably on purpose, but I think they would look much better in focus, but still smaller like they are off in the distance. I like the new form and shape of this classic. Well done. "Still the gold standard in digital images, Ryan." I'd forgotten how cool this image looked. It is now my new wallpaper. hey ryan if you can get this scene into vue through importing the polygons as a wire frame and retextureing the scenery, it would be really awesome to get a crystalized version of fluorescence using the diamond or impossible glass materials in the object editor.... just a thought. This may have been one of your earlier images but it still, in my opinion, is one of the most awe-inspiring images you've created to date. The mixture of colors flow seamlessly making it look as if it's illuminating is remarkable. Keep up the fantastic work! Looks like I misspelled this file and the 1080p when I uploaded them. I've renamed the files and they are now working. Sorry about that! Will you be posting the updated version of this image in 1024x600 netbook resolution? Self-explanatory (almost): went to d/l this for my netbook and got a file-not-found error. I like both, but I still prefer the Picklejar version. I don't know why exactly; the new version seems more static or something. But this version certainly isn't shabby -- perhaps I'll change my mind when I put it up as wallpaper. If you create other colors, would you consider purple as well as red and green? Thanks! The Picklejar 1152 link is broken. I finally have the 1080p file sorted out and the high res version should show. Sorry about that! I prefer it with out the dust but i liked the shadows on the mushrooms in the original better. Are you going to do an iPhone version of Fluorescence (2009) without the "pixie dust" also? I actually prefer the dust.. and think there could be a little more of it. But the original is still fantastic too. Looking forward to seeing the other colors! "so I added the new 1080p rendering..."
so I compaired the latest 1080p rendering to the last one. the new one looks VERY fussy and out of fucus compaired to the last one. untill theres a newer, less fuzzy version, Im sticking to the pixie dust version. It's tough. I couldn't choose between the 2000 version and the 2009 version with dust. So I was using both of them. Now with the addition of the 2009 dustless version....OK, so now I have all 3. I don't understand all the complaints about the dust version as it didn't take anything away from the scene. A refresh of one of your best works can't go wrong, good job, I like it. Personally, I love the pixel dust, so I'm keeping the one from the pickle jar. All in all, good job. This is looking good. Looking forward to the other colors. Although, I imagine that a 150x150px rendering (or whatever size Twitter asks for) doesn't take very long to build? FWIW, I like the "pixie dust." It adds some more depth and mystique to the image. The proper file is not up for the 1080p. Still learning a new system for creating all these sizes and haven't worked out all the bugs yet. Sorry! I would love to see other colors and multiple monitor versions of this. Its not dramatically different enough to get a solid vote from me, too much the same! The 1080p version shows up as a 1024x600 image, and the 1024x600 link is broken. Thanks for the great wallpapers throughout the years! Nice work Ryan!! I love both versions. Any possible chance some more colors could make the cut into the picklejar? An awesome re-work of a classic image! Any chance we'll see this version in a multi-screen render? I find it amazing how fundamentally the same piece of art can look so different. There is something about the cleanness of the 2000 version that yes, has defined DB over the years. Having said that, the 2009 version looks pretty cool too. Can't wait for the other colours, hopefully without the dust!!! Would love to see other colors of this and the year 2000 one. Yep, art isn't ever completed, only abandoned. I have Fluorescence as the main pic on my iPhone; right now I've switched it to the red version, so I can have that much less light pollution when using my iPhone while stargazing. Only problem is that this is the older geometry that doesn't look as good. It would be great if I could update it! Thanks! Couldn't help but smile as I read, "The new one is more realistic... Are you trying to make [photorealistic] pictures ...?" I am rendering a version without the dust. Everything else I like. As I said, the old versions aren't going anywhere. From a technical viewpoint certain aspects of the original were looking dated to me. "The More I look at the new & old"
I still like them both. What a great remake of one of my alltime favorites of yours! Really beautiful, Ryan. To be honest, I wasn't as fond of the earlier update as I was of the original, but this one trumps them both. The original wasn't really one of my favorites, but I can't think of DB without Flourescence. With that being said, the subtle details that you added with this update are excellent. It's like a high-def update to an already classic pic. Superb work as usual. These have always been a favorite of mine. Thank You! A big fan of the earlier, cleaner look of which my only critique would be where the stems and terra meet. This baby brother of the db star, for me, will always be in its siblings shadow. Quite artistic. Very nice touches. This is a very cool version of Fluotescence! The dust could add a cool effect if you tweaked it a little. Make the dust look more like duct and less like spots. Glad to see you reworked this image as it was the first one I ever saw from you. Just reminds me why I am a subscriber :) Thanks! "*shakes head at the dust*..."
It was this image that made me shellout for a lifetime membership... its just awesome. i've spent the last 20mins looking at the new image (instead of working :P) and i really don't like the dust; it just looks out of place, especially the bright one under the right side of the middle mushrooms hood. other than that, i like it... i think it shows how much you've grown as an artist. I have switched back and forth looking at the 2000 vs 2009 versions. I understand why some people like the smoothness (almost surreal feeling) of the 2000 version. It is soothing somehow. That said I like the 2009 version better. I like the texture of the ground and the mushrooms. I am not a huge fan of the 'dust' but I love the texture on the caps. Overall I say this one might be taken from the 2000 version, but is a completely different piece. 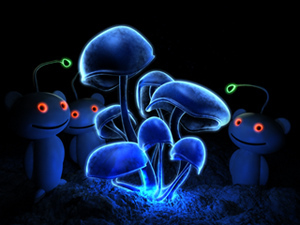 "Update on the last comment"
But when I actually set it as my wallpaper, i couldn't help to notice that now the mushrooms are slightly shifted rightwards, was this on purpose?... I liked better when they were more centered, otherwise excellent work! It's actually not a bad update (I'm glad you didn't change it too much). I might still prefer the original (I like the smoothness of the mushrooms, and they seem to glow more in the original), but I like this one too. I don't like the floating specks too much, though. FINALLY A NEW RENDITION OF THE ORIGINALL!!!! "I like the new version." I enjoy the new version of Fluorescence, quite a bit. I think the 'mushroom dust' is a nice addition to the piece. If I could arm-chair quarterback for a second, the viens/soapy effect of the right mushroom is very cool, and I would like to see that more defined in the other mushrooms. All in all, I enjoy the new version. Just a thought for the new webpage you're putting together. You might put in a comparison option for reworked images so we can look at them next to each other and see the changes you've made. It'd be a great way to see how the technology and your style change over time. As for the image, it's classic DB with interesting changes. Even more, it ties in perfectly with the da Vinci quote on the new images page. Great work! This will always be a favorite, as it absolutely defines DB to me. I like this remake, but one thing is driving me crazy: the blue spots over the image. It just takes away from the picture having those spots floating around everywhere, if you ask me. Otherwise, the render is A+. Maybe it lost a LITTLE something from the original, but still awesome anyway. I like the 2000 version mushrooms but the 2009 version of the ground. The smoothness of the original's caps I find much more soothing somehow. The detail of the 2009 ground would provide an even greater tension of original mushrooms caps. I'd love to see the triptych for this version. What are your thoughts Ryan? Ive been going back and forth between the 2000 and 2009 versions and Im certain that I perfer 2000 best. I like the smoothness of the 'shrooms. The new image makes them look like they are starting to decay a little. I like it! I understand that some people are too used to the original to like this one, but I really appreciate the effort put forth in this update. The distortion of the stalks under the mushroom cups is a nice touch. Keep up the great work! I have been wanting to make this comment for sometime. I think there is a fine line between a piece of art and an illustration of something. Making something more real looking isn't always the best for the art involved. I like the original. It was interesting and eyecatching. The new one is more realistic, but that is not necessarily a good thing. As the software evolves, that is something that you should keep in mind. 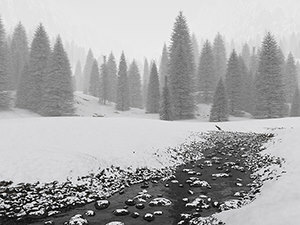 Are you trying to make a photoreleastic pictures or works of art? That is for you to decide and for us to enjoy the fruits of your labor. Very nice, I think this is just the update Fluorescence needed. This is up there with the holiday red and green one from a few years back. I would honestly say that what I liked about the original is now missing. While yes, you did keep it very much like original, the high detail of the mushrooms themselves I would say takes away from what hooked me about the original. The smooth glowing "feel" was what made the original surreal and great. I however do not mind the enhanced texture of the ground, I think it adds a nice dimension. Interesting...Technically they're better but I've gotten so used to the ultra-smooth shrooms in the previous version that I just prefer that version anyway. I don't know about the kind of software that you use but I'm curious why you'd have to specifically render the image in a certain size rather than just re-sizing a larger image down to a smaller size like I do in my photo program all the time. How would it look different? The original has always been one of my favourites and I love this update. Are you going to do colour variations like you did with the original? overall I love it, superb detail. I just really don't like the 'specs' in the 'air' around it. If it weren't for that I'd have given it a 10 instead of 9. This is an awesome reworking of this image! I love it! Cant wait for the Dual-Monitor renders. Now I know why you said it was autobiographical. It really is the essence of db. I have no idea how difficult it is to make the moving backgrounds for DreamScene, but I think this one would look good just like the first fluorescence did. As well as summer wood with the slowly lighting & darkening fireflys. It is almost a combination of your 1999 & 2000 versions. And I think updating your "classic" image every oh 9 years or so with new programs is a good way to keep the fresh look. Personally I like them both. And I like the light that seems to be bursting up from the ground at the bottom of the mushrooms. Makes you wonder what is down there that created them or made them glow. The only thing that I would change is (at least in the HDTV image) is the stalks of the mushrooms are almost coming right out of my start bar at the bottom of the monitor. I think it looks better with a little bit more of the ground in between the start bar & the base of the mushrooms.